He time travels in his sleep. You learn this the morning after your first date at the dive bar that never checks IDs. You’d drunk so many whiskey sours you had to spend the night on his futon, and as you’re sneaking out of his dorm in the early morning, embarrassed, ready to never see him again, he sits up in bed shouting Alamo! Alamo! in a gritty Spanish accent, different from the low, soft voice you’d heard the night before. The longer he sleeps, the farther back he goes. Stage 1: He sees his mother smoking cigarillos at Woodstock. Stage 2: He’s with Shackleton on Elephant Island, tasting smoked penguin meat. The sound of seal songs travels up through the ice. Stage 3: Swashbuckling pirates, women weaving tapestries as their husbands fight wars on distant islands, glacial summers. The REM cycle is when things really pick up. Over coffee, your second date, he tells you he’s made it back to the Cretaceous period, where he saw a triceratops take down a T-rex — cool, right? On your third date, a picnic by the river, he says he once saw Jesus feeding mallards in Bethlehem. Sometimes he experiences the past from the outside, an invisible pair of eyes. Sometimes he slips inside the mind of a spectator, feels the pooling of sweat on his collar bones, the movement of air through the nose as if it’s his own air, his sweat. You soon realize that normal dating rules do not apply. You remember something your mother told you when you were sixteen: Only trust a man as far as you can throw him. But you’ve never met a time traveler before, and you’re intrigued. He has dimples just like your grandfather did, and he wears blazers with elbow patches, and this makes you trust him. One night in his dorm room, over Styrofoam containers of Pad Thai, he asks if you want to go steady and you say Yes. His dimples show and he can’t look you in the eye and you melt for that kind of vulnerability. Your time traveling boyfriend sleeps in on weekends and takes you on drives in the afternoons. Windows down, corn stalks whipping, he describes the smell of Edinburgh castle in springtime during the Iron Age. He explains how to load a musket. When you ask about his own history, though, he changes the subject. You begin to think of him as a deep blue glacier. You read once that glaciers contain small pockets of ancient air, trapped at the time of the glacier’s formation. But the glaciers are melting now. They are releasing all of that old air into the atmosphere. Mixing, slowly, old with new. After the drives, you take your boyfriend to parties hosted by the frat boys in your Spanish class. Your boyfriend is shy about his time traveling, but after you’ve had a couple of drinks, you can’t keep quiet. He’s so talented, you insist to the DJ. He’s practically met Kant, you tell the miniskirted girls in line for the bathroom. Your time-traveling boyfriend doesn’t seem happy at these parties. He gravitates to the corners of rooms: to the fish tank in the kitchen filled with Yuengling bottle caps, to the Godzilla statue made out of beer cans and sticky with Coors Light residue. When you find him, he kisses you quietly, even though your mouth is slick with beer and lip balm. Let’s go to sleep, he says. Your friends motion to you from the dance floor, shimmy under blue lights, skin flawless and icy. You feel your time-traveler boyfriend’s hand, warm as a seashell, cup your knuckles. You leave the dancers, follow him out the door. He dreams of snow, of woolly mammoths, he dreams he’s crossing the Bering land bridge. You stay awake, watching his eyes move under their lids, wishing you could see what he sees. In December you call your mother to tell her you have a boyfriend. Okay, she says. She says, Maybe you shouldn’t come home for Christmas this year. Your Dad and I are going through a rough patch. You might be happier at school. Condensation inches up the windows, and you draw circles on the glass with your pinky. Your time-traveling boyfriend helps you with your American History final. Your time-traveling boyfriend takes you to see Braveheart in the theater and talks over the action —Wallace was wayyy taller than that. You stay on campus over winter break, and your boyfriend goes home to New Jersey, four hours south of your university. You wander the empty hallways of your dorm, checking for unlocked doors. When it snows, you close your curtains to the cold. Your boyfriend calls you every night before bed. Sometimes you hear a young girl’s voice in the background. Sometimes you hear a man yelling, and you can’t tell if it’s with anger or enthusiasm. Sometimes your boyfriend falls asleep with you still on the other line and you wait for someone, his mother maybe, to silently hang up for him. Your boyfriend tells you, I wish I could travel farther. How far? you ask him. What do you want to see? And he answers, The beginning. I wish I could see the beginning. He always seems on the edge of an explanation, on the edge of finding the right way to order the words for you. When your boyfriend returns to campus, you’re waiting outside his room. He pulls you inside and tells you he’s met a woman who can help him. In my dreams, he says. I’ve met someone in my sleep. You think, Queen Elizabeth? You think, Cleopatra? You know he’s seen her once before. Only her ankle, actually, as she glided on a palanquin through Actium, but still, Cleopatra. But no, he tells you, it’s no-one famous. It’s a pirate girl who sailed on Calico Jack’s ship. He tells you she wears fish hooks for earrings. She’s an orphan. He’s seen her twice. She’s the first person I’ve ever seen more than once, he tells you. I remember wanting to see her again, and I did. If only I can hold onto my feelings for her, maybe I can use them to propel myself back farther. Maybe I can control my dreams. He still loves you, he reassures. His dream life is separate from his awake life. You don’t leave your boyfriend, because how can you be jealous of someone long dead, someone who probably died at sea, someone whose bones turned to dust, to fish food? In the weeks that follow, he tells you about other women he meets, women who he is sure hold the key to his dreams. A cave maiden who slayed a mammoth with her bare hands. A wild horse tamer and a leather tanner. You spoon him in his too-small twin bed, wondering which one he’s with tonight, how they are helping him in ways you cannot. You feel for his dimples as he sleeps. You remind yourself you can’t be jealous of a ghost. Tell yourself ghosts are not competition. Let your boyfriend sleep in on Saturdays and buy him chocolate donuts in exchange for pterodactyl anecdotes. Let him run with Aztec warriors at night, and let him take you on picnics to Gettysburg during the day. He’ll make you scones inspired by the food at King Arthur’s court and chicken wings that aren’t quite as tasty as sabertooth tiger, he says, but close. One afternoon, your friends, friends you haven’t talked to in weeks, ambush you after class. They say they miss you. They say they saw your boyfriend asleep on the lab table during Chemistry. Even the professor, dropping books on the table and shaking the back of his chair, couldn’t wake your boyfriend up. You shrug, say your boyfriend has been under a lot of stress, walk off. But really, you’re afraid. You’ve noticed your boyfriend swallowing Melatonin and Tylenol PM before bed. You don’t sleep in your own room anymore, afraid to leave him alone, afraid that without you anchoring him to the now, he’ll succumb forever to his dreams. You try asking him about present-day things. You ask him about his family, about his sister, about his father. But he shakes off these questions. I can’t think about them, he tells you. They’ll only distract me. What do you think you’ll find? you ask him. If you ever make it to the beginning? He thinks. 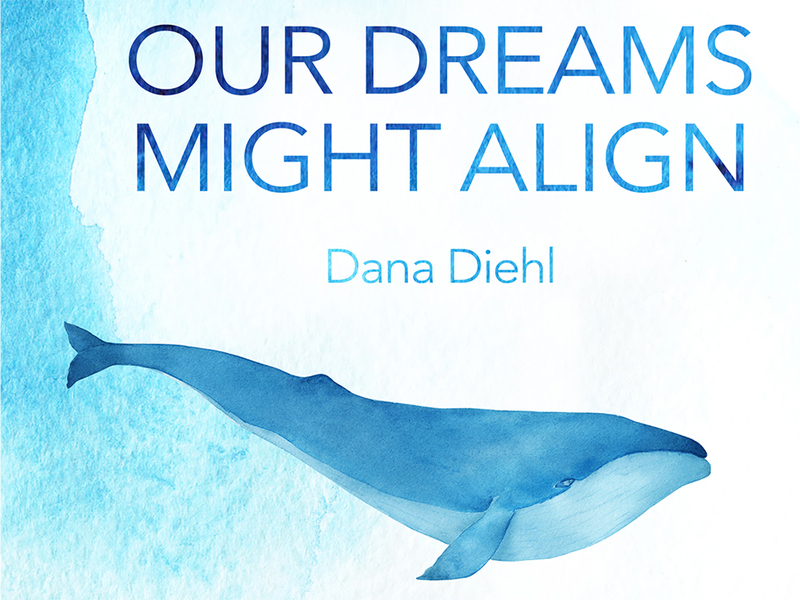 You’re imagining the long-deceased women he’s met in his dreams and you feel more than a flicker of jealousy. Then he says, I don’t know. That’s the thing. Maybe the Big Bang. God. You don’t ask how long he’d have to sleep to get back that far. Instead, you try to be supportive. Say, I time traveled once. Say, I flew out of London on a Friday and landed in Newark on Thursday. You wake him up only once. He’s twitching in his sleep. He moans in a way you can’t identify as pleasure or pain, and this scares you. You grab him by the shoulders. He’s shirtless, his skin unfamiliar and sticky with sweat. You feel his blood beating under his skin. He won’t wake up at first, and you throw back the sheets, blow hard into his ear, pull at the skin on his elbows until he gasps awake. Looking at you, he scrambles out of bed and falls against his desk, scattering papers, knocking over the pocket watch you bought him for Christmas. He’s shouting in a language you don’t recognize. Ukryć dzieci, kochanie. Oni nas znaleźć. Zaraz, gdzie ja jestem? It reminds you of your first night together, when he woke up speaking in Spanish. In a few moments he’ll be back to normal, back to himself. Calm down, you tell him. It’s okay. You try to hold your boyfriend by his shoulders, but he brushes you away. Nigdy nie będzie moją rodzinę, he says, eyes wide and panicked. You reach for him again, and this time he pushes you hard. You slam against the wall, your elbow knocks into the television, which falls to the tile floor. The screen cracks, sparks. Keep it down, someone shouts from a neighboring room. You sit in shocked silence. Your back tingles with pain. Your boyfriend stands with his fists raised, his eyes narrowed with suspicion. For the first time, you realize you fear him, have maybe feared him all along. He taps the broken television with his bare toe. We’ve got to stay quiet, you tell him. We’ve got to stay calm. Your boyfriend glances at you, then walks to the door. He fumbles with the door knob for a moment before he’s able to pull it open. No, you say. You follow him down the fluorescent-lit hallway, down the stairwell, and out onto the dark campus. You’re both in pajamas and bare feet, and when he slips onto the lawn and the thin skin of snow, you follow him. Your boyfriend kneels in the snowy grass, and you stand behind him. You can feel the cold aching into your feet and up your ankles. You know your boyfriend must feel it too, but it seems to quiet him. You watch his back as his breathing slows and his shoulders relax. When he stands up, he’s himself again. You can see it in the familiar droop of his shoulders and the way he hooks his thumb self-consciously under the elastic band of his pajama pants. You take a step toward him, but he holds up a hand. Why? you ask, and he shakes his head. I almost made it, he says. I was so close. I was alone in a dark forest. I could feel myself shrinking. I was devolving. But then, then you pulled me out of it. He sighs. He walks past you, back toward the dorm, leaving ghostly footprints in the snow. You think you’ll follow him, but then you don’t. Instead you just watch him get smaller and smaller until he’s reached the building and disappeared inside the dark doorway. You are still barefoot, but you don’t feel the cold like you did a moment ago. The lights glow over foggy streets. The snow is melting. You realize you’ll return to your own dorm tonight. You wonder how far you can walk before the sun comes up. 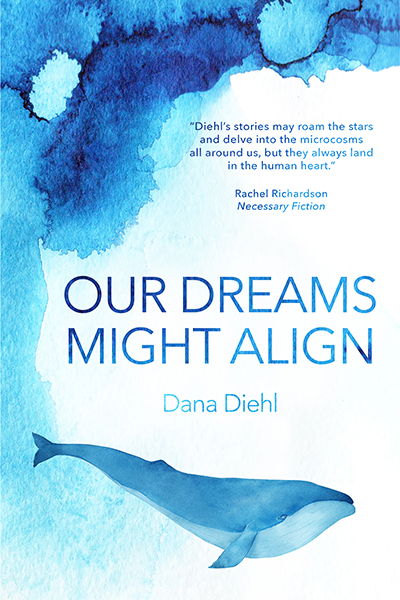 Dana Diehl is the author of Our Dreams Might Align and a chapbook, TV Girls, as well as the co-author, with Melissa Goodrich, of the short story collection The Classroom. 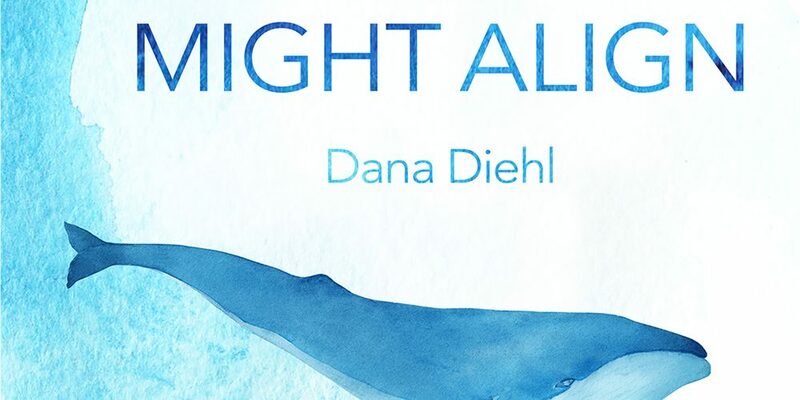 Her work has appeared in numerous venues including Smokelong Quarterly, The Collagist, and Necessary Fiction. She lives in Tucson, Arizona. She can be found online at danadiehl.com and she tweets @Servestofurther.